March | 2018 | What Next? We were having supper in a small hotel in Portugal and my husband struck up a conversation with the only other diner, a man from Chicago. He was in Portugal looking for a retirement home to buy. He and his wife had planned to retire in Arizona or Florida but the election of Donald Trump and the fear he might get re-elected in 2020 has them looking elsewhere for a retirement residence. Our dinner companion said he wants to throw up every time he sees Donald Trump on television. He called him and I quote “a moron without morals.” He told us he is particularly sickened by the evangelical Christian support of a man who is the antithesis of everything Christianity should embody. I asked him why he thought Donald Trump enjoys so much support in the United States. His answer was quick. “It’s racism. Pure and simple.” He felt Donald Trump made people feel less uncomfortable about their underlying racist tendencies. He was sure Trump was voted in as a back lash against the election of a black president. 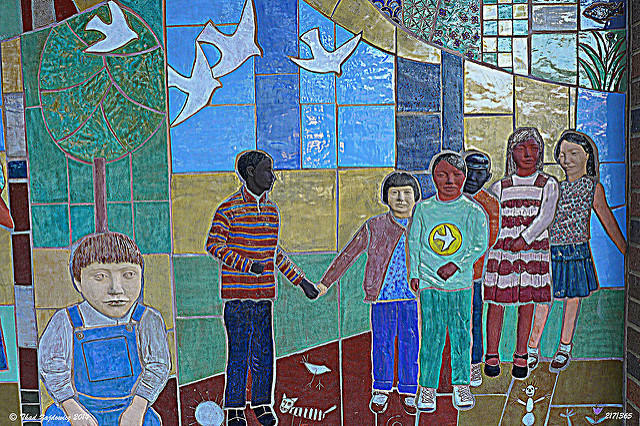 The morning after our conversation with the Chicago businessman I happened to read an article in The Atlantic called The Heavy Burden of Teaching My Son about Racism in America. It was by Jemar Tisby, a PhD history candidate and the president of a group called The Witness. 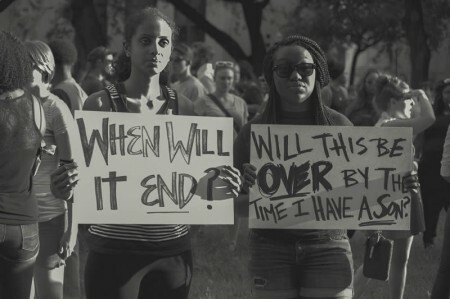 They seek to engage the Christian church in an honest dialogue about racism in America. Tisby’s article explained how he, like all diligent black parents, has had to introduce his seven- year old son to the reality of racism in the United States. Black parents must remind their children early and often that people may consider them threatening for no reason. They must tell their kids they will have to work twice as hard as others and won’t get second chances. They have to teach their children that just hanging out with other black kids in too big a group can raise suspicion. I had wanted to believe my Chicago acquaintance from the previous evening was exaggerating when he talked about the extent of racism in the United States. Tisby’s article suggested he was not. And we Canadians need not grow too smug, We have our own issues of racism to address. Here are ten good things that happened to me my first week back in Canada after two months in Portugal. Ten good things to be thankful for on Good Friday. The elderly Chinese woman at my gym who gives me a smile and a wave each and every morning…. ….came over and gave me a hug on Saturday when I returned to the YMCA after my two month hiatus. I had a lo……………ng wonderful non-stop talking lunch with my good friend Esther. I got a cute photo from my grandsons in Saskatoon posing with the Easter treats I sent them. I helped with a family afternoon at the Winnipeg Art Gallery where nearly eighty parents, children and grandparents turned up to do soap stone carving together. I had a fantastic meal at my sister and brother-in-law’s house along with my husband, one of my brothers and his wife. 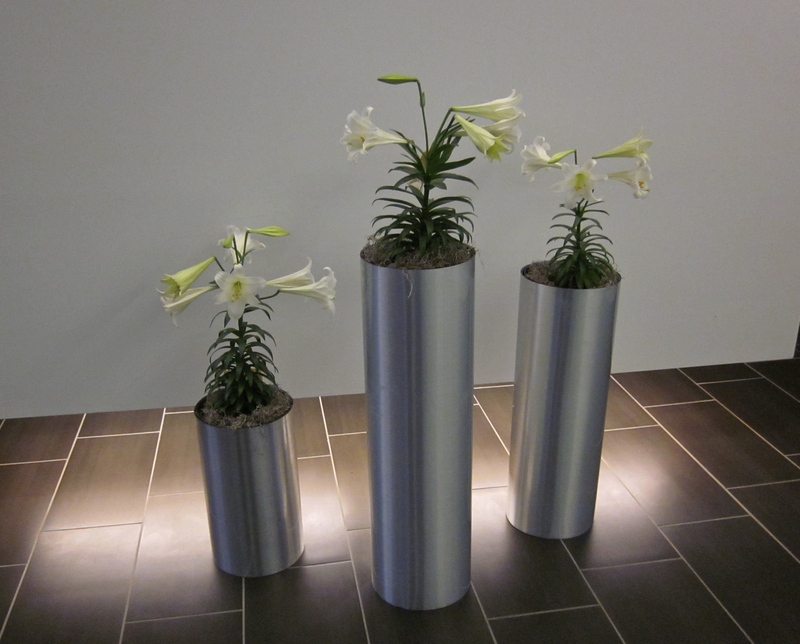 We talked avidly about family, politics, work, religion, retirement and vacation experiences. I had an interesting discussion with a fellow church member who came to the church library where I volunteer, to find a book about the Mennonite experience in Ukraine. She is planning a trip to Ukraine. My niece and I celebrated her birthday as we have done each year since she was eight with a visit to the Winnipeg Art Gallery and lunch out together. What a great time we had discussing books, education and all kinds of other things. I gave a tour to a perceptive group of kids at the Winnipeg Art Gallery for a spring break camp and they found four details in an artwork I had NEVER seen before even though I have shown that same painting to hundreds of art gallery visitors in the past. I went out for sushi with my cousin and we caught up on almost everything we’d missed talking about since I left in January. We enjoyed a family Sunday. Lunch with my Dad and in the evening a tea party with our daughter-in-law while watching the Jets win on television. Although I was very sad to see The Marrow Thieves voted off Canada Reads yesterday the fact that American War by Omar El Akkad remained a contender means I can write about it while it is still in play as a possible winner. We have heard so much talk from politicians about terrorists, and how we need to protect ourselves from terrorists, and this book tells us how we can do that………create more equality between the haves and have nots of this world and stop wars. Wars and their aftermath create terrorists out of young people with promise and potential. Sarat the protagonist of American War is a child living in a time when the United States has become a third world country because of climate change and a divisive civil war. The war means Sarat is deprived of her father, proper schooling, medical care, adequate food, clothing and shelter. She is suspectible then to a mentor who can provide her with some of those things and most importantly give her life a sense of purpose. She is easy prey for terrorist recruiters. This is a dark, dark book. I started out liking Sarat. My affection turned to overwhelming sadness and anger for what Sarat became. What a waste! American War puts a human face on terrorism and helps us understand that the recipe for creating terrorists is failing to address economic disparty and deciding to solve differences with war. Violence and poverty create fertile ground for terrorism to flourish. American War is just way too depressing and hopeless a book for me to want it to win Canada Reads. Since my first pick The Boat People and my second pick The Marrow Thieves have both been eliminated from the show I will have to cheer for Forgiveness to win today even though it was my number three pick. Is the Solution to Ending Terrorism Really This Simple? Well at least things righted themselves a little in the Canada Reads contest yesterday. Precious Cargo which I wanted voted off the first day is gone now and The Marrow Thieves which I championed yesterday has remained. My blog readers responding to yesterday’s column were vocal on Facebook about The Boat People’s elimination. One said it was an absolute travesty and another felt the panel members were sadly lacking when it came to being connoisseurs of good literature. 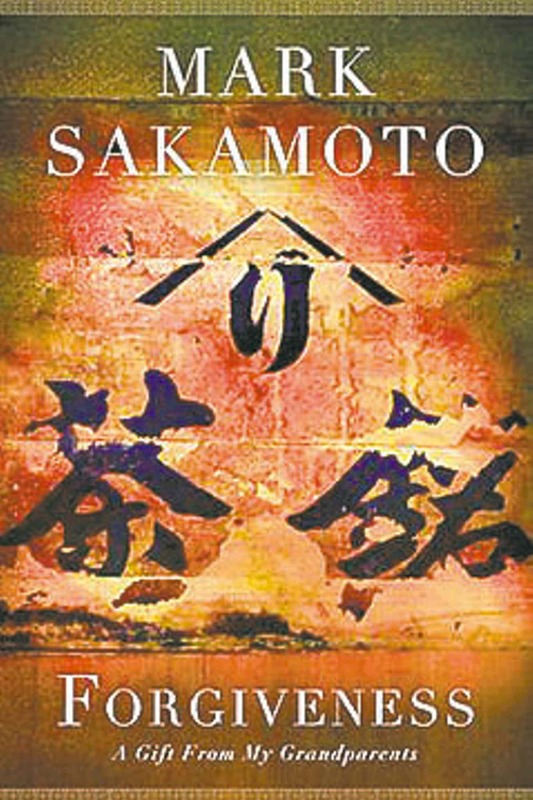 My third place pick for 2018 would be Forgiveness by Mark Sakamoto. The first part of the book completely captivated me. Mark tells the World War II story of his maternal grandfather who was from the Magdalen Islands in the Gulf of St. Lawrence and served as soldier stationed in Hong Kong during the war. The Japanese take him as a prisoner. I felt such a strong connection to this story because the history of Hong Kong was part of the curriculum I taught at an international school in Hong Kong and I visited all the places where Mark’s grandfather’s story unfolds with my students as we learned about what happened when the Japanese attacked and occupied Hong Kong during World War II. 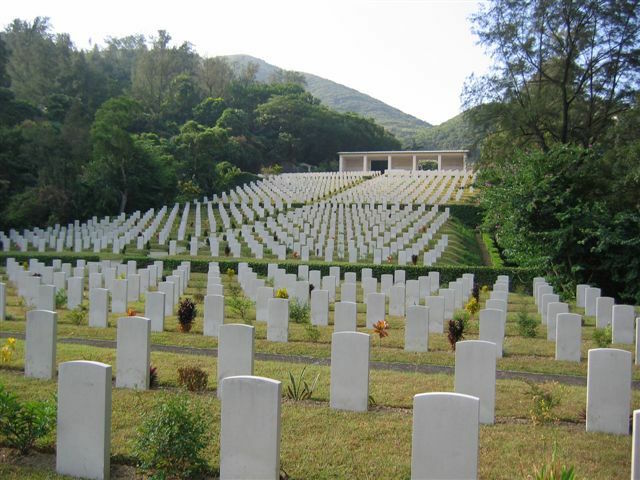 The cemetery where all the Canadian soldiers are buried in Hong Kong was my very favorite place in the city. Woven in with this narrative is the story of Mark’s paternal grandmother, born in Canada, whose Japanese family was living a good and prosperous life in Vancouver when World War II broke out. They lost everything when the Canadian government forced them to move inland. Mark’s grandmother’s family ends up working like slaves on a sugar beet farm in Alberta and living in a chicken coop. Mark Sakamoto made me really love his grandparents and so I was sorry that during the second part of the book we hardly heard about them. The latter part of the book is all about Mark’s mother and her fight with alcoholism and addictions and how those impacted her son. There are brief references to his grandparents in this section but I wanted to know so much more about how they related to their grandson and to his parents as they walked through so much grief. How did they feel about their children’s divorce? What was happening in the grandparents’ lives during this time? The story about Mark’s mother is a riveting one but I agree with some of the Canada Reads panelists who felt Mark should have written two books, one about his grandparents and another about his mother. I hope Forgiveness doesn’t get eliminated today. We will see if my hopes are realized. I have one more book to blog about and that’s American War. I am having a birthday lunch with my niece today and she LOVED the book so that should give me additional perspective when I blog about it tonight. I can’t believe it! They eliminated by far the best book! I can only think of one reason the Canada Reads panelists removed the wonderful book The Boat People on their first day of debating and that is because they were being protective of their own books. They knew Sharon Bala’s novel was the best and so they decided getting rid of it would give their books a better chance. Although the main character is a young sixteen year old boy named Frenchie there are some wonderfully strong female characters in the book like the old woman Minerva -full of courage and tradition, the little girl RiRi full of curiosity and liveliness and the young woman Rose full of rebellion and independence. The book ably covers two issues very important to Canadian society- climate change and reconciliation with our First Nations. This is a young adult novel and I want it to win because more people need to discover that books labeled young adult can be great adult reading too. Unlike American War, the other Canada Reads novel set in a dark future The Marrow Thieves actually leaves one with some semblance of hope for our world and has likeable characters you can cheer for. We are constantly rethinking just exactly how the word ‘family’ should be defined and have come to realize families can each look very different. The Marrow Thieves really makes us think about what it means to be part of a family and not just your biological family. I am almost scared to pick a new book to win Canada Reads when my initial choice was eliminated on the first day. I hope The Marrow Thieves fares better today. Whatever the outcome I’ll blog again tomorrow about one of the other books. During our time in Portugal I managed to read all the books nominated for the upcoming Canada Reads competition. 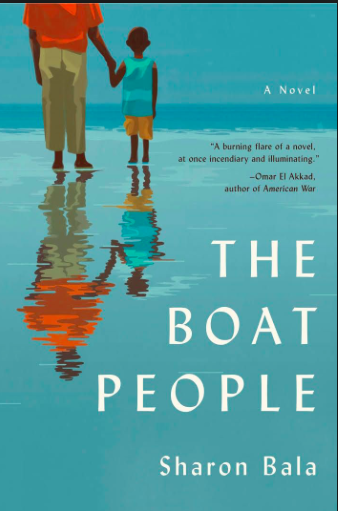 The first was The Boat People by Sharon Bala. I’ve already reviewed it in a blog post and after reading all the other contenders Boat People remains in top spot on my list! It a good story, very well written, offered the viewpoints of three different narrators, two of them women, and it truly address this year’s theme of A Book To Open Your Eyes by offering interesting insight into Canada’s immigration system. So I really hope it doesn’t get voted off on the show today. I also know which book I hope does gets voted off today. 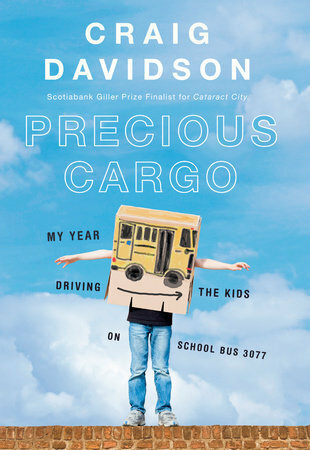 Precious Cargo by Craig Davidson really lured me in initially. It is autobiographical and the way Craig describes his dysfunctional personal situation at the start of the book literally had me laughing out loud. Craig’s life is changed during the year he drives a school bus for special needs kids. As a teacher who has worked with many children with special challenges Craig’s description of his relationship with these terrific kids warmed my heart and rang very true. But……………. he also includes excerpts from a novel he tried to write about the same experience and these excerpts just didn’t fit or make sense to me and took me out of the narrative. And………he tacks on this whole section at the end of the book reflecting on his experience and trying to explain what it meant to him and what it should mean to us. It was completely unnecessary. The story of his year with those children and how they captured his heart speaks for itself and I didn’t need to be told what to think of it. I plan to follow Canada Reads closely and will be doing further blog posts about the remaining three nominees. Stay tuned! I’m trying to draw cartoons. I was inspired by Canadian author Carrie Snyder who has been sketching a four frame cartoon every day in 2018. 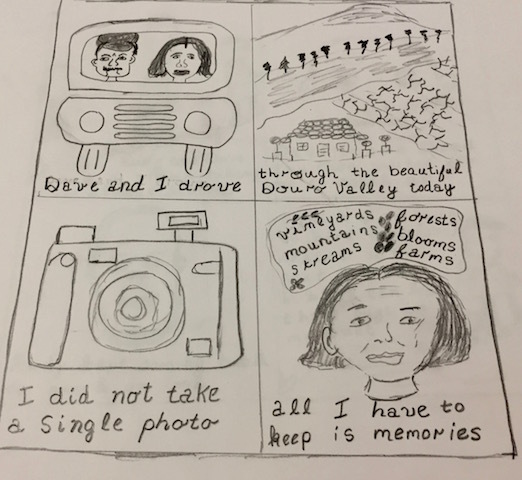 She is a professional writer, not a professional artist but is exploring her creativity by doing quick daily cartoons. In one of them she reminds us we don’t have to be technically skilled to be an artist. My writers’ group has been reading the book The Artists’ Way and it encourages us to explore our creativity in new ways, by stretching ourselves. If you have been following my blog you know that during our two months in Portugal I’ve been trying to do eight things everyday to improve myself as a writer. I’ve written about five of those things – the sixth is drawing. I’ve done a sketch or a drawing everyday, but the last couple of weeks I’ve been trying to do those drawings in the form of cartoons. Some of them tell about experiences I’ve had. Here’s one. Some of them summarize things I’m learning. 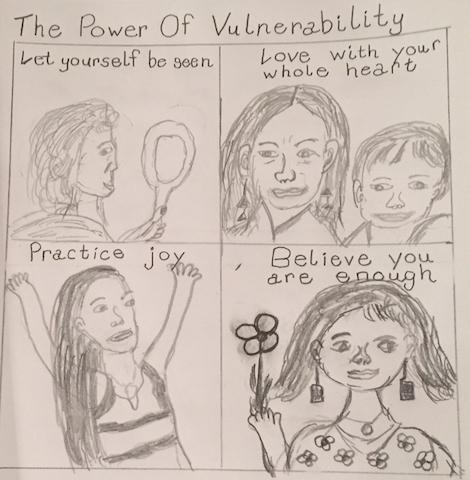 My writers group listened to a Ted Talk by Brene Brown. This is how I summarized it in a cartoon. I think drawing cartoons can help me become a better writer because it makes me think about experiences and ideas in new ways and forces me to summarize them in just a couple phrases. Note: I have written about six of the daily things I did to work on my writing skills during my time in Portugal. The seventh is to write these blog posts everyday and the eighth is working on the books I make for my grandsons. On this holiday I’ve been creating a songbook for my younger grandson’s upcoming birthday.